Boats become abandoned I imagine because they are no longer seaworthy, have become too much trouble to look after or their skipper has put them into a place that is just not worth the bother and expense of salvaging them. This is the case in the above abandoned boat in Bowen Qld above and on the Noosa river below. One recent famous case of the abandon ship being called was when the Pasha Bulker, a coal carrier, whilst waiting in open seas for permission to enter Newcastle Harbour for loading, ran aground on Nobby’s Beach (the main surfing beach in Newcastle) in a severe storm on the 8th June 2007. Instructions were given to her, along with 56 other waiting ships, to put out to sea to escape the approaching storm. The Pasha Bulker disregarded the advice and beached at 9.51 am in horrendous weather. The Westpac rescue helicopter, at great risk, winched the 22 crew members to safety, abandoning ship. Fears were held that it would break up causing a huge pollution problem and the nation watched as the salvage operation took place. The first two attempts failed but on the third attempt on the 2nd July at high tide successful reflotation occurred to the great relief of all. It was eventually towed back to Japan on the 26th July 2007. 20. Weekly Photo Challenge: Abandoned | Pa-BLAM! 43. Weekly Photo Challenge: Abandoned | Travel. Garden. Eat. 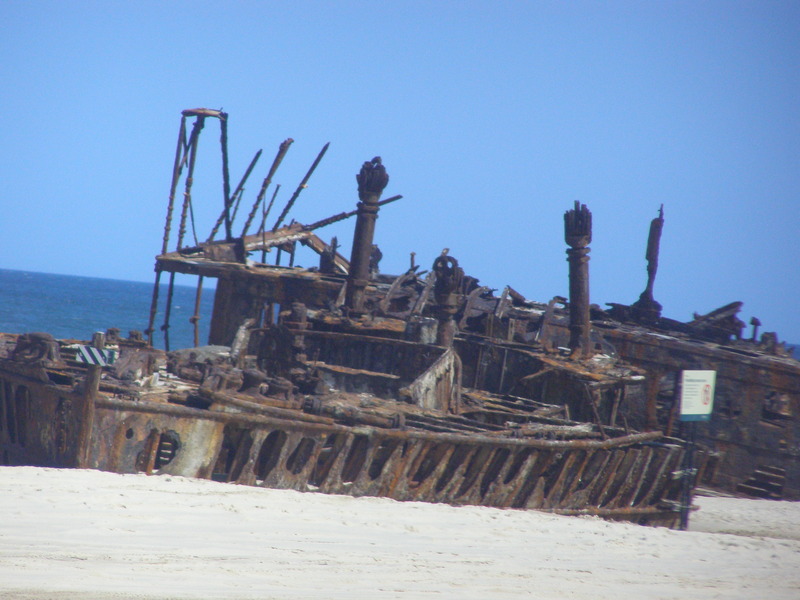 This entry was posted in Daily Post prompt and challenges, Historical Perspective, photography and tagged Daily Post, Fraser Island, irene waters, Pasha Bulker, Photography, postaday, ship wrecks, Weekly Photo Challenge. Bookmark the permalink. Pingback: Weekly Photo Challenge: Abandoned | What's (in) the picture?